Just Ducky: A beautiful day. It's a Stihl MS 360. It's newer then my 039, a smidge more powerful, lighter weight, and professional instead homeowner quality. This will be my new primary saw, with the 039 as the backup. I'll probably alternate them quite a bit, and the 360 can handle a 24" bar that I need to easily buck up the occasional larger tree. 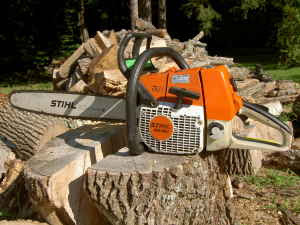 It's always good to have two saws, especially when felling trees -- last thing you want is to have a tree weakened and your saw break, leaving a very dangerous snag that could fall wildly in a strong wind. Drove home through Boston Hollow, had a long visit with my mom, came home and grilled pork chops for lunch. I had quite a bit of eye strain, so I wasn't up to doing work for the non-profit, so I went for a long Sunday drive down to Beach Pond and around Sterling & Foster. Came home and pulled in by the garden to check it. First, having drunk a large ice coffee while driving I had to pee...really...bad. So I did. As I'm zipping up, I look up and see a deer 50' in front of me with an annoyed, "Why are you peeing on my lawn?" look. Well she did as deer do, and jumped away once I made eye contact. Jumped all of 50 more feet, and from 100' away continued browsing while I checked the garden. Less respect then Rodney Dangerfield. Hunting season can not arrive too soon. My garden which is a disaster this year due to flu, weather, and critters and I'm mostly planning for next year. Harvested about 5# of summer squash, which will be about it for the year...wow, 361# harvested last year. And to think I had wanted to donate 400# to the food pantry alone. After that I brought the PC I reloaded Windows on back to Henry for his grandkids to bang away on, made some spaghetti for dinner (and pork-n-spaghetti lunches), did laundry, and had some ice cream. Life is good. Best day I've had in a long time. What a day! I got tired just reading about it. That was nice of you to fix the computer for the grandkids. Haha, my verification word is "sweeti"